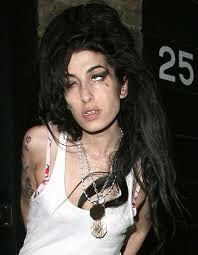 So Amy Winehouse is dead. R.I.P. Does it make me sad? Not really. Probably from a drug overdose, although that’s just speculation. Winehouse, it seems, had given up and refused to treat herself. With all the scares, rehabilitation sessions and advice she remained in a heedless state. But whose fault is it that she died? Was it hers? Maybe it’s her fault that she decided to lead the life of a druggy. Or is it her ex boyfriends fault? It was him, apparently, who got her to start taking hard drugs. Being a celebrity isn’t easy. If one day she came home and was extremely stressed and her boyfriend – ‘the love of her life’ – told her that she would be able to relax by taking certain substances, it would have taken a very strong minded individual to refrain. One thing would have lead to another, until she was an addict. Some people are, of course, more susceptible to becoming addicts and maybe she was one of those people. What’s disturbing, however, is the lack of care record labels seem to give to their artists. Of course, I don’t know exactly what help record labels give their artists, but clearly it isn’t enough. Becoming a celebrity can change a person’s complete psychology and they need to be guided. But it seems as if record labels are just concerned with money making at the expense of their artists’ health and emotional well being. We’re conditioned to see the deaths of celebrities as more of a tragedy then those of civilians dying in terror attacks. But the tragedy in Norway is incomparable to the death of Amy Winehouse, but most people, it seems, are more perturbed by the latter. On the news yesterday, we were bombarded with accusations that the attacks in Norway were done by ‘Muslim extremists’. Fox News were quick to say ‘Muslim extremists have bombed Norway’ – not particularly surprising coming from that xenophobic, racist and Islamophobic channel. But what’s crazy is that supposed ‘experts’, on various news outlets, were convinced that it was Muslim extremists or Al Qaeda who were responsible. And what do we find out? It was a Christian fundamentalist. Although I don’t like associating religion to acts of terror as the two are the complete antithesis of one another. Lastly, I have started questioning the reason why people use Twitter. The majority of tweets are people telling others about their life. Do we think that we’re that important that we have to tell others about our doings? I don’t think I’m important. That’s why I mostly tweet about things which educate others and myself. This ‘me’ culture is dangerous. But selfishness and egoism is endemic within our society. We’re indoctrinated to believe that everything is about ‘us’. But we are just tiny creatures in the vast expanse of a grand universe. We’re insignificant, really. The only sense that we are important is that we are creations of the Divine who created us for a purpose. And it is this purpose for which we were created that we should endeavour to fulfill. Wrote this in about 3minutes. Sorry for any grammatical mistakes.